Definition at line 37 of file metaclasst.h. Definition at line 41 of file metaclasst.h. Definition at line 58 of file metaclasst.h. Referenced by LLMetaClassT< TObject >::buildMetaClass(). Definition at line 51 of file metaclasst.h. 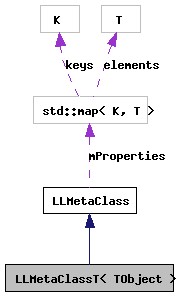 References LLMetaClassT< TObject >::LLMetaClassT(), and LLMetaClassT< TObject >::reflectProperties(). Referenced by LLMetaClassT< TObject >::instance(). Definition at line 43 of file metaclasst.h. Referenced by tut::TestAggregatedData::getMetaClass(), tut::TestReflectionData::getMetaClass(), and LLPermissions::getMetaClass(). Definition at line 77 of file reflection_tut.cpp. References tut::TestReflectionData::mInt, tut::TestReflectionData::mNullPtr, tut::TestReflectionData::mObj, tut::TestReflectionData::mPtr, tut::TestReflectionData::mString, reflectProperty(), and reflectPtrProperty(). Definition at line 895 of file llpermissions.cpp. References LLPermissions::mCreator, LLPermissions::mOwner, and reflectProperty(). Definition at line 60 of file metaclasst.h.